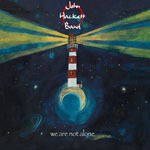 Share the post "Album review: JOHN HACKETT BAND – We Are Not Alone"
Let’s be honest. John Hackett has for too long laboured in the shadow of his better known older brother. He’s guested on Steve’s classic seventies albums and appeared in his live band. He’s made two albums previously as ‘John Hackett Band’ and ‘We Are Not Alone’ adds to a commendable if not exactly prolific output. Alan Jones of GRTR! called 2015′s ‘Another Life’ “an under-stated gem” and the same could be applied to the latest release, a near 50/50 mix of vocal tracks and instrumentals. Hackett is happy to let his band shine on this album, notably his guitarist Nick Fletcher, but adds exemplary flute and a pleasant lead vocal throughout. Stylistically, the album occupies the prog space somewhere between Alan Parsons Project, Camel and Supertramp. So it’s well produced, melodic, and punctuated by fluid guitar. Where’s Steve? Well of course there’s a guest appearance – on harmonica – on ‘Never Gonna Make A Dime’. Elsewhere his influence and presence is felt on the acoustic instrumentals ‘Blue Skies Of Marazion’ and ‘Ossian’s Lament’.